HANDCRAFTED WITH GREEN STAINED GLASS DRAGONFLY BRONZE TABLE LAMP 25. 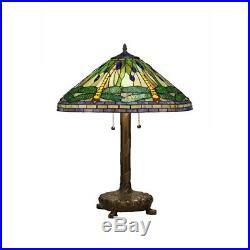 This delightful Tiffany Style table light has been high quality with green recolored glass enclosed by copper thwart. The shade is featured by dragonfly themes in tones of green and yellow. The shade has delightful blue jeweled accents to compliment the design. Classy zinc alloy base for a great look. 2 on/off pull chains offers ease of use. Uses two 60-Watt bulbs and is CFL compatible. Colors on the shade are lighter and more vibrant when illuminated. Table lamp stands 25 in. Our stock all ships from our US-based warehouses. We stand behind our products. We do our best to process as quickly as possible. Most orders are in transit for two days but some may take longer. Thank you for shopping with us! The item "HANDCRAFTED WITH GREEN STAINED GLASS DRAGONFLY BRONZE TABLE LAMP 25" is in sale since Thursday, July 12, 2018. This item is in the category "Antiques\Decorative Arts\Lamps". The seller is "caymanibc" and is located in McDonough, GA 30253 . This item can be shipped to United States, Canada, United Kingdom, Denmark, Romania, Slovakia, Bulgaria, Czech republic, Finland, Hungary, Latvia, Lithuania, Malta, Estonia, Australia, Greece, Portugal, Cyprus, Slovenia, Japan, Sweden, South Korea, Indonesia, Taiwan, South africa, Belgium, France, Hong Kong, Ireland, Netherlands, Poland, Spain, Italy, Germany, Austria, Israel, Mexico, New Zealand, Philippines, Singapore, Switzerland, Norway, Saudi arabia, Ukraine, United arab emirates, Qatar, Kuwait, Bahrain, Croatia, Malaysia, Brazil, Chile, Colombia, Costa rica, Dominican republic, Panama, Trinidad and tobago, Guatemala, Honduras, Jamaica.